This is not a trail as such like the others, but more a trail through time. 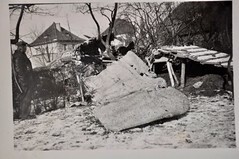 It covers an area of aviation that is certainly one of my favourites and sits on the site of the old Salisbury Hall – as mentioned in the Doomsday book. 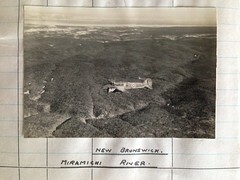 An ancient and historic place, it was to be the place where de Havilland gave birth to that ‘Wooden Wonder’, the Mosquito. As a child I have recollections of having my photo taken standing beside, what seemed, the enormous undercarriage of an amazing aircraft. Yet trawling through old photos, I am unable to locate it, perhaps it has been lost in moves, packed away in a box probably never to see the light of day again. However, the memory remains and since then, I have always looked at the Mosquito with a certain awe. Oddly, those memories didn’t match what I actually saw. I seem to remember a number of Mosquitoes standing in an outside area, all in superb condition, whilst the latter is true, the former is somewhat different. Maybe, my memory is a little jaded or maybe as time has progressed, changes have happened and the examples I saw, or thought I saw, have long since gone. 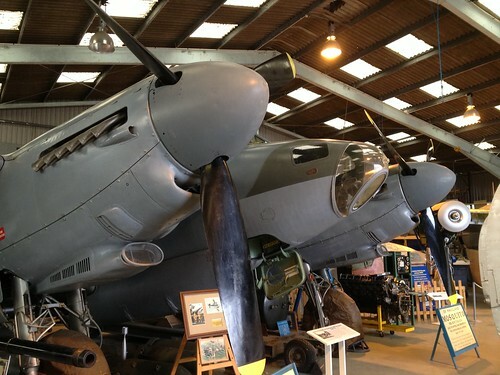 Certainly in the day, it was referred to as “The Mosquito Museum” rather than the “de Havilland Museum”. The Mosquito was of course made famous by films such as 633 Squadron and ‘Mosquito squadron’ where David McCallum played the lead part as ‘Dambusters’ met 633 Squadron. 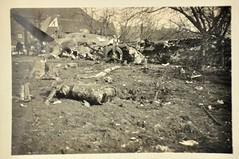 Some time following these films, certain parts of the aviation fraternity were outraged at the ‘needless’ destruction of the Mosquitoes by raising the undercarriage whilst taxiing and then setting fire to them. At the time, it was little more than good effects, but looking back, it was a terrible waste of a beautiful and now very rare aircraft. 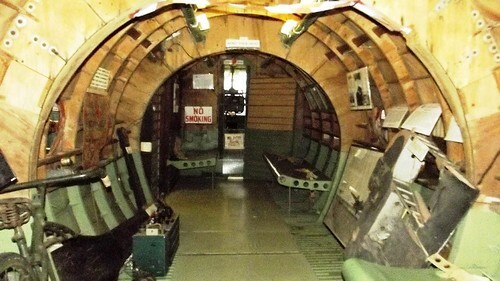 The de Havilland Museum is now a sanctuary and time capsule for all things de Havilland. If you look behind some of the sheds you will see the largest collections of Mosquito wings, body parts and wheels ever; all wanting to be restored. 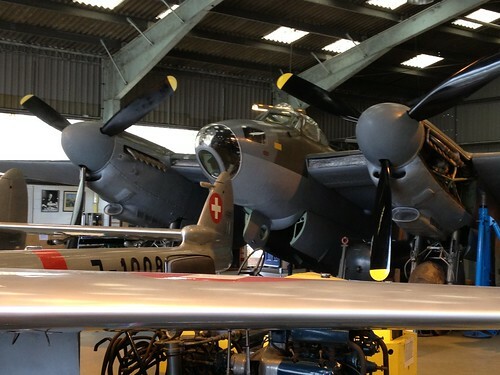 However, before this turns into a Mosquito requiem, lets look back through time at de Havilland. 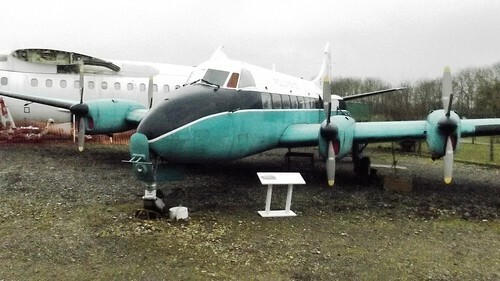 The de Havilland Heron – looking in need of some TLC. The museum is located down a side road and you honestly believe you are driving down someones driveway. The museum is located very close to the M25, the traffic can be seen and heard a few hundred yards away. It, like many other museums, is run by a dedicated bunch of enthusiasts who put their heart and soul into making it work and preserving the history of the de Havilland aircraft Company. 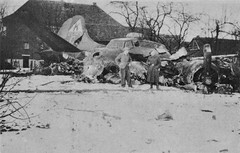 On site, which is relatively small, are a collection of some 15/16 aircraft and numerous bits of others, mainly whole, some in part but they are there and viewable. Most are kept outside, as a result, some are sadly in relatively poor condition, but that is not to say not loved and cared for. Like many, they crave money and time spent on them, a thankless and endless task. Each a moment in time of the company. As you walk round the site, you walk through history. A Heron, Dove, DH125, Vampire and Venom await your inspection. What I liked about this museum in particular, was that many were open to view. 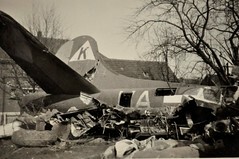 The Vampire was of course, the link to my father and his tales from his RAF days. The Heron and Dove a reminder of the ‘good old days’ when civilian transport was in its relative infancy. Behind these, stands the fuselage of a Comet, closed off and looking rather in need of a lick of paint, it stands majestically as father of the fleet. 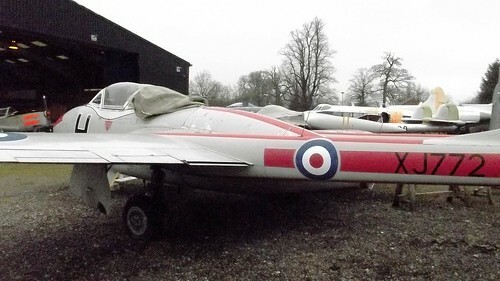 A de Havilland Vampire trainer. Moving round the corner, a Sea Vixen open and accessible, has an array of weaponry beneath it, reminding us that de Havilland Company were a major game player in the once thriving industry of weapons of war. Its cockpit a mass of buttons and dials. Ladders enable you to enter and sit at the controls of the ‘oddly positioned’ cockpit. As a youngster building Airfix models, the Illustrious and Ark Royal were both in the collection and the Sea Vixen, along with the Buccaneers were tiny little aircraft I use to love playing with. Seeing inside put it all this into perspective for me. The Sea Vixen, another remarkable aircraft also in need a of a repaint in 2013. Sitting behind the Vixen, is a small room named the ‘Pre War aircraft Hanger’. Compared to modern, even ‘T’ ‘T2’ or ‘J’ Type hangers, it’s not a ‘hanger’ but more a room. However, within its walls are a small collection of some of the most beautiful examples of pre-war aircraft you are ever likely to see. Also, a small section of a Horsa glider, rescued from a farm in Kent where it was used as an animal sanctuary. Also here are examples, of models and artefacts collected over the years. Returning back to the main entrance you pass the front section of a Trident. Again steps allow you to enter and experience life on one of Britain’s most famous airliners. There are also various displays including the history of the de Havilland company, its milestones and achievements. 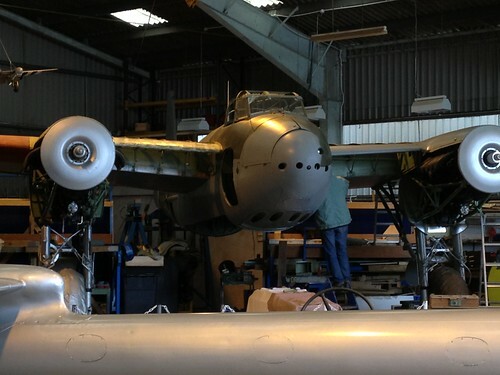 Next door, a workshop, where you can peer in and be amazed at the work it takes to restore these beautiful aircraft. 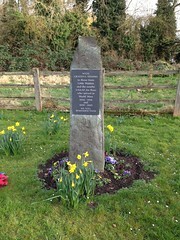 On the opposite side, lies a small but poignant memorial dedicated to all those whose flew, or maintained Mosquitoes during and after second world war. Also, an almost insignificant concrete block. On closer inspection, it is a mould use to make the fuselage of the Mosquito. Taken in 2013 whilst still under restoration – the Prototype ‘Wooden Wonder’. Of course, then the main attraction. Originally designed to look like a barn to put off marauding attackers, the main and central hanger, is the very building where the first prototype Mosquito was built all those years ago. On entering, you come face to face with a Mosquito. Superbly restored to a beautiful condition, it’s the pride and joy of the museum. The work that must have gone into getting it such condition must be amazing. Next to it, stands the original prototype currently under restoration. Looking at this, you can truly see how it came by its name, the Wooden Wonder’. A mass of struts, wooden panels and metal, they are truly superb aircraft examples and a testament to the work of the de Havilland company. Also in here, and somewhat overshadowed, are a Swiss Vampire and another Vixen painstakingly dissected and standing against the wall. Of course no de Havilland collection would be complete without the little Chipmunk. How many aircrew started their flying careers in this little delight? 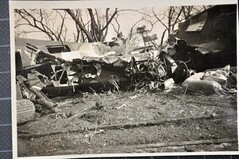 Yes, many of the external examples are in need of a little tender care, but this is a rare corner of aviation history. A trail of one company’s history through two world wars and a cold war up to the 1960s when British Aviation turned a corner. It is a unique collection of aircraft, cared for a by a small collection of volunteers, in a small rural location next to the expanding and overpowering monster that is London. The de Havilland Mosquito, a rare and beautiful aircraft! Update – the prototype was finally unveiled on November 25th 2015 at precisely 14:45 the same time that it made its maiden flight 75 years earlier. The BBC news report is available here. 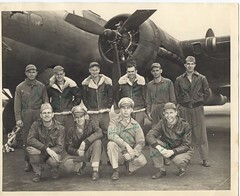 The museum has a website with all the up-to-date information.